Whew! This took a good couple of hours, but I'm really proud to share this one! For those of you who don't know, I'm a die-hard Monster Hunter fan. 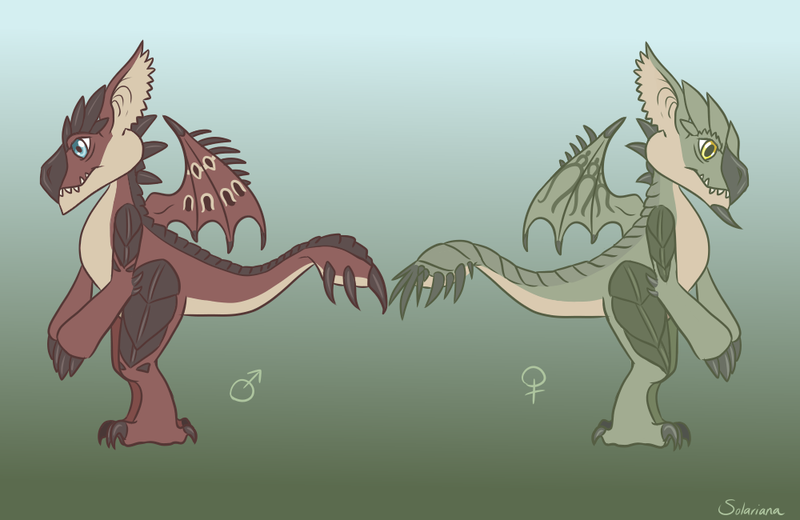 One of the most famous monster lines in this series is the Rath family, consisting of Rathalos (the male) and Rathian (the female). I decided to design a new Norn breed based upon this lovely couple! As always, these are just a concept for now and I'm not planning to develop them into a breed. However, anyone is welcome to step in and do so as long as I'm credited as their designer! Woah these look super cool, nice work! And Norngirl, thanks so much! @Dragoler - it was a challenge to get those wings right on my bat breed. I think this look better with the wings on back to be honest anyway. Nice redbrown and green colors,fits nicely to them. Very nice design, though I think it would be cool if the wings were a part of the arms rather than separate on their backs. The only breed I've seen do that would be the Bat Norns for C2 I believe?